The restaurant says the black bun is just from a dye, that it should taste the same. It actually looks kinda cool, though it doesn’t look edible. Still, I’d try it, given the opportunity. For those of you curious why this is happening now, it’s to promote the re-release of The Phantom Menace — this time in 3D. 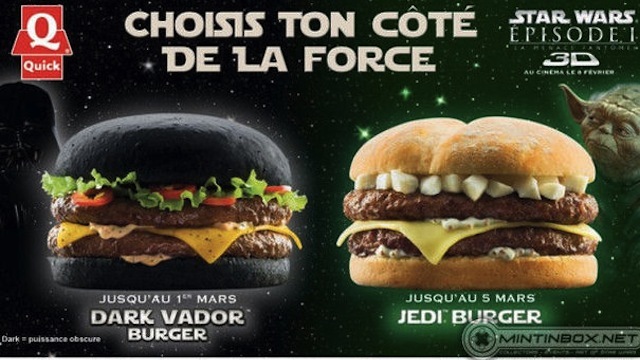 And if you noticed the spelling of Vador, apparently that’s how it’s spelled in France. I don’t know why it would change, but whatever. We missed last week’s caption contest for various reasons, so perhaps this week’s should be double the awesome? Well, I don’t know about that, but how about one with double the Darth Vaders? It’ll have to do. There’s some potential with this one, for both puns and Star Wars references, as well as original humor. So put your thinking cap on (or take it off if that’s how your randomness flows better), and come up with something funny to explain this picture. 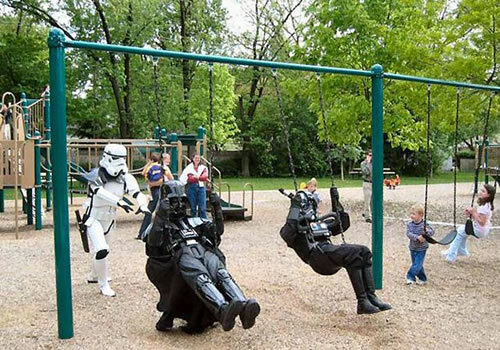 This week’s caption contest has a Star Wars theme. 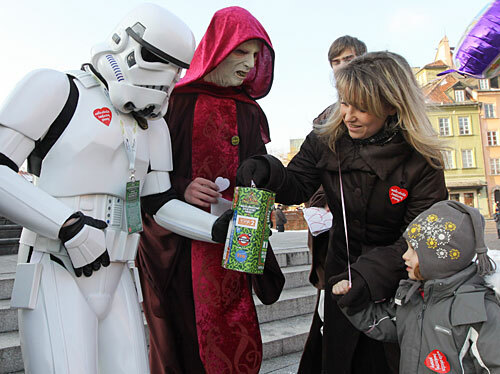 It appears that the Sith Lord and an Imperial Stormtrooper are either selling something or asking for donations. Who knows what’s really going on. But that’s where you come in. Figure out what’s happening, and write a comment about it. Of course, your explanation / story doesn’t have to be anything realistic at all — just funny. 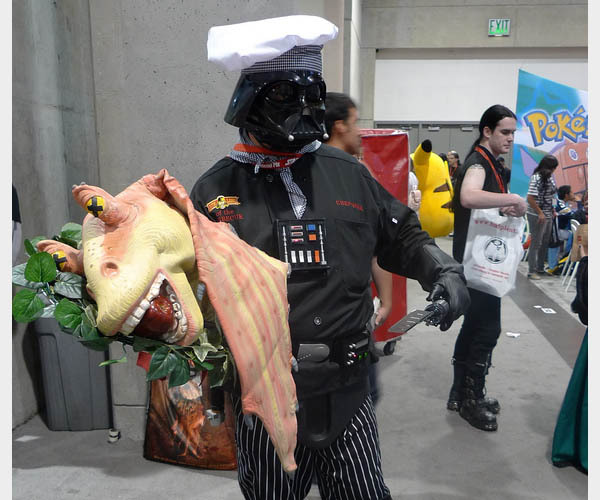 This week’s caption contest features both desserts and Star Wars humor, so it’s bound to be good! 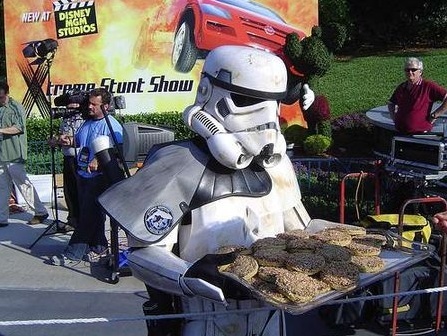 The photo is of an Imperial Stormtrooper carrying a tray of food, which looks to be some sort of cookies or donuts. I’m not sure what the food is nor what is going on, but that’s okay, because you get to write the context. If you think of something funny explaining what could be going on here, let us know in a comment. Or even if it doesn’t explain the story but is funny, that’s fine. Just keep it clean and make it funny. 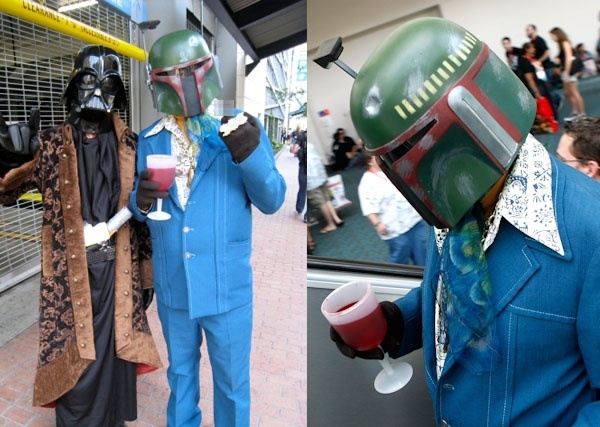 Here’s some more pictures of costumes for Halloween, parties, conventions, etc. 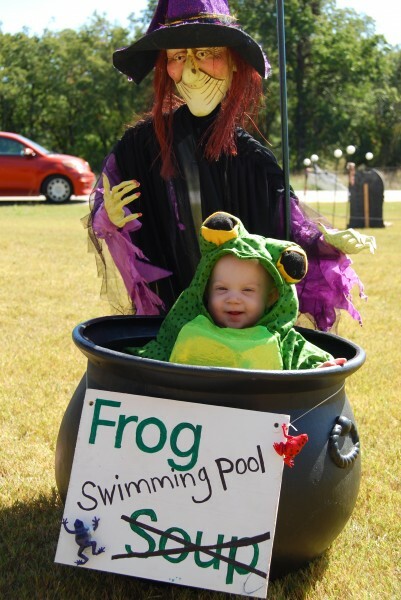 The first funny costumes post featured superhero costumes, so this one will be more random. Some are from popular franchises like Star Wars and Halo, and there are some creative and well-done ones in here, too. Feel free to comment on any of them, if you have something funny to add. 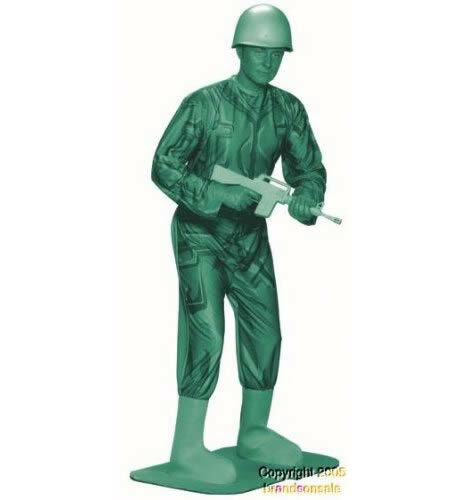 If you want to be a generic green army man, you can buy this costume. 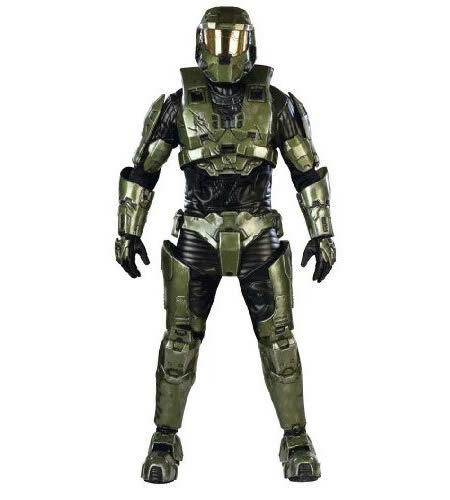 This is the hero, Master Chief, from Halo 3. This one will be popular! You can get a cheaper one for $68.95, but the "supreme edition" (shown) is $779.99. 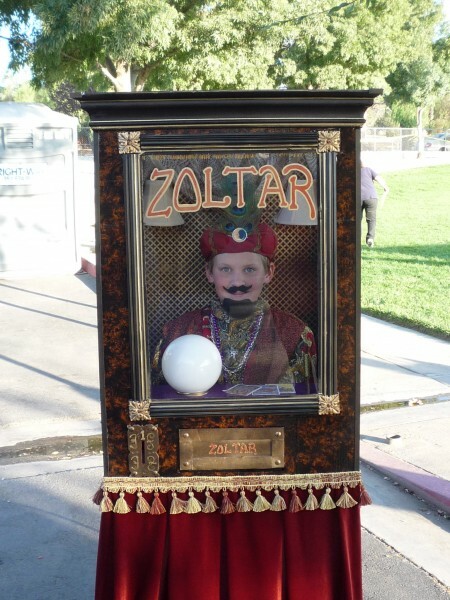 Zoltar, from the movie "Big". This is very well-done! It's not for sale, but at this link they tell how they made it. Once again this is getting long, so I’ll put the rest in another post. 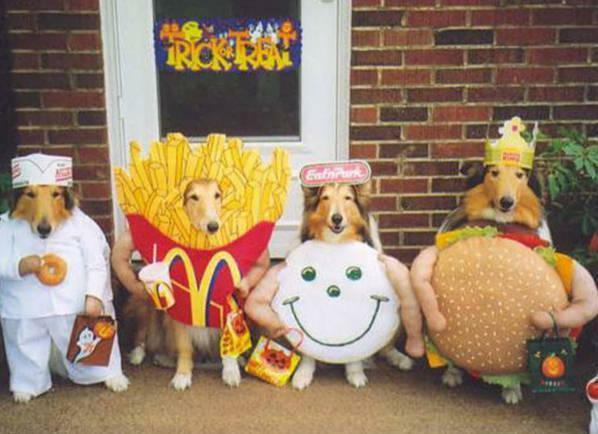 Here’s a link to search for the other funny costumes posts. Hans Solo as Magnum P.I. Do you remember the Magnum P.I. TV show? Someone made a version of it featuring Hans Solo as Magnum P.I., and it also includes Chewbacca and Luke Skywalker. Whoever did this put a lot of time into it. Just watching it by itself, it’s neat, but you don’t realize just how good it is until you compare it to the original. That’s why I’m including three versions of it, and you can watch them in whatever order you want. The third video is a side-by-side comparison of them both, which reveals just how much attention the creator paid to detail.